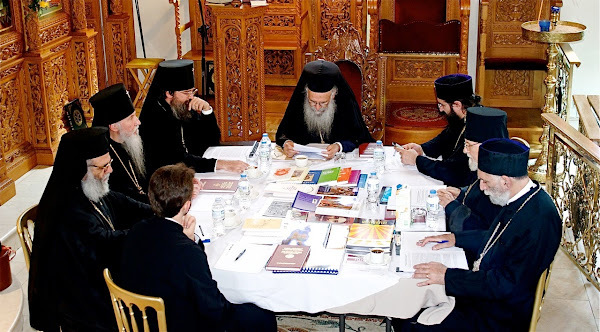 (ROC-Sourozh) - Members of the Pan-Orthodox Episcopal Assembly for Great Britain and Ireland, who will be attending a regular meeting of the Assembly, will concelebrate the Divine Liturgy at the London Cathedral of the Dormition, Ennismore Gardens, on Saturday, April 25th at 9.30am by invitation of His Eminence Archbishop Elisey of Sourozh. The Chairman of the Assembly, His Eminence Archbishop Gregorios of Thyateira and Great Britain, will preside. This will be the second time the assembled hierarchs have celebrated the Liturgy together. The first celebration took place at the 3rd meeting of the Assembly in June, 2011.